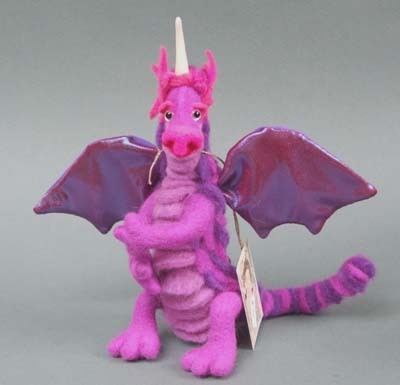 G'Faw was hand sculpted over a wire armature by repeatedly working raw wool with a felting needle until it formed the desired shapes that make up one of a my dragons. Then sheets of flat felt were created by hand before being cut to form the shapes for the scales which were individually added to the basic dragon shape. The wings were cut out, sewn and fitted in place then the finishing touches were applied such making and fitting the horn and hand painting the eyes. The whole process took 7 days to complete.